Many health professionals, even those fully in favour of low-carb diets, recommend supplementation. Dr Atkins stipulated it as a requirement for Atkins Induction – the ketogenic phase of Atkins Diet. Supplementation is the simplest way to boost your Keto Diet. You can breeze towards your ideal weight even faster and easier. Vitamin deficiencies can lead to a range of potential problems – from extreme fatigue to a weakened immune system and illnesses. Cutting out high-carb foods like grains and fruit reduces the amount of vitamins in your diet. Low-carb foods, like red meat and green leafy vegetables, also contain plenty. It is possible to get all the vitamins and minerals from Keto foods alone. But only if you spend your carb allowance on the most vitamin-rich low-carb foods. You would need to plan your meals meticulously and track the vitamins in foods – in addition to counting carbs. 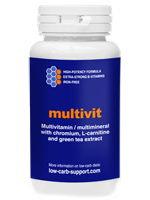 A multivitamin is a much simpler solution. A high-quality, extra-strong formulation covers all bases and prevents any accidental nutritional gaps. Burning fat instead of carbs for energy is a radical change for your body. It can take several days or even weeks to adapt. But it’s not the only change. Cutting out grains and fruit also alters your micronutrients intake. Even if you manage to get all the nutrients from low-carb foods, their composition is going to be completely different. If your body doesn’t get its usual vitamins and minerals, you could get strong cravings for specific foods. If you used to follow the standard health advice before going Keto – such as eating lots of fruit and whole grains – you might be especially vulnerable. Supplementing vitamins and minerals can make this transition period easier until your body adjusts to your new eating habits. Some vitamins have extra benefits above and beyond the prevention of deficiencies. Research shows that extra-strong dosages of vitamins B and C can reduce fatigue and improve your energy levels. Tiredness is common before you switch into ketosis. But it can sometimes strike even after you are keto-adapted. If energy levels are a problem for you, try a multivitamin with extra-strong dosages of B and C vitamins. Other supplements you can take to fight fatigue are Co-Enzyme Q10 and L-Carnitine. Electrolytes are essential trace minerals. The key ones are sodium, potassium and magnesium. You will drink more than usual on Keto, which depletes electrolytes. Electrolyte deficit causes headaches, tiredness and muscle cramps – common Keto Flu symptoms. Replenishing electrolytes helps to avoid this problem. Potassium and magnesium are the two key minerals to replenish. It’s difficult to get sufficient amounts from Keto foods alone. 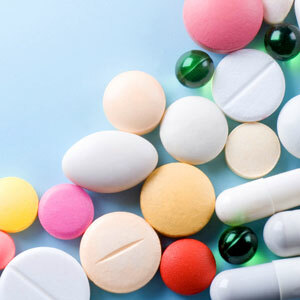 Watch out for dosages – unlike most vitamin/mineral supplements, an overdose of either potassium or magnesium can have unpleasant or harmful side effects. Get a multivitamin with 100%-200% of RDI for magnesium, and 15-20% of RDI for potassium. That will keep you within the safe non-toxic dosages, and help to fight Keto flu symptoms. Chromium plays a role in regulating glucose, insulin and lipids. Studies indicate that chromium supplementation can reduce hunger and sugar cravings. For this reason, chromium picolinate is a popular supplement amongst dieters. Chromium is often included in multimineral formulas. To get the full benefits, get at least 200µg a day. Other supplements that can help with sugar cravings are green tea extract and omega oils. Being on a diet – even one as easy as Keto – can be stressful. You work hard to plan your food, count carbs and avoid temptations. In addition, your body usually interprets weight loss as a worrying sign of food scarcity. Mood swings and low spirits are not uncommon amongst dieters. Once again, this is possibly related to micronutrient deficiencies. If you experience this problem, daily multivitamin supplementation can help. Oxygen is essential to our survival. But there is one downside – sneaky molecules known as free radicals. These molecules gradually destroy cell membranes in our bodies. Over time, this contributes to heart problems, inflammation and other health conditions. The jury is still out on whether a low-carb diet causes more oxidative stress. Some research indicates it might actually reduce it. In either case, antioxidants are beneficial to everyone, regardless of their nutrition. Vitamins A, C and E, selenium and zinc are strong antioxidants. 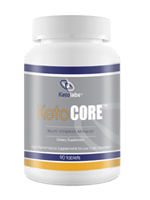 The following brands produce multivitamins and other supplements designed especially for Keto dieters.